England's children's commissioner has asked the French government to help lone children in Calais's refugee camp reach relatives in the UK. Anne Longfield has written to French authorities to ask them to speed up the asylum claims of 150 children who may be eligible to travel to the UK. She also claimed the French were not protecting lone children at the camp. A French Embassy official said his country had done "a great deal" to ensure the children's welfare. The children, some as young as 10, have fled fighting in Syria and elsewhere. Ms Longfield told BBC Breakfast that unaccompanied children at the camp were very vulnerable. "We're talking about cardboard shacks - it rains, they fall down. They're by themselves, it's extraordinarily dangerous, they're at risk of health [problems], trafficking, any manner of danger there. "They're not being protected while they're there [and] some of those children are actually eligible to join their close family here." 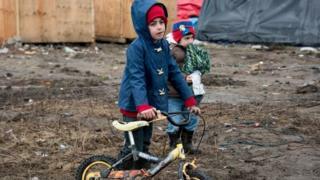 In her letter, Ms Longfield also expressed concern about children who are thought to have disappeared since the French authorities dismantled parts of the camp, known as the Jungle, earlier this year. She said 129 of them had gone missing, the charities working with them had tried hard to trace them and the authorities must do likewise. Charity workers are said to have identified the children who are potentially eligible to move to the UK because they have parents or siblings there. Ms Longfield's call follows a visit to the camp to meet children living there alone while waiting for their cases to be reviewed. She said: "I have asked the French authorities to urgently determine which of the children in the Calais refugee camp are eligible to come to the UK, to ensure their safety and to process their applications immediately. "We expect authorities in the UK to make sure vulnerable children in England are looked after and we expect nothing less of the French government." A spokesman for the French embassy in London said there were, "indeed, several dozens of lone minors in Calais who have links to the UK and, according to the Dublin agreement, would have the right to enter Britain to be reunited with their relatives there". He said French authorities had identified them and sent details to UK counterparts. "France has done a great deal to ensure the welfare of those children," he said. "When part of the so-called "jungle" was dismantled, they were relocated to the emergency accommodation nearby. "However it is by no means a prison, they are not locked in and we cannot prevent them from leaving should they wish to do so, while they are waiting for the UK to decide on whether to admit them."